5.0 out of 5 starsEmotional ride! Compelling reading with a very unexpected twist. A brilliant plot with very credible characters . I usually find that moving from one character's perspective to another in each chapter is disjointing but not here. Excellent! I was completely captivated by The Widow and eagerly awaiting this book but unfortunately the subject matter didn't grip me. There was no sense of urgency this time. I'd love book 3 to be more like book 1 please!! The intricacies of that were impressive. It’s taken me about 3 months to finish this book. I just couldnt get into it. However I enjoyed the last couple of chapters. 5.0 out of 5 starsAn emotional ride, but brilliant read! Having not read THE WIDOW, I didn't know what to expect with THE CHILD. But it is a brilliant psychological thriller that, I feel, does not disappoint...despite having guessed the outcome quite early on. I didn't let that deter me from this exciting thrill ride readers were bound to find themselves on, as there are enough pieces of the puzzle to leave many guessing regardless. I just found myself drawing the conclusion quite early on - that isn't to say others will. THE CHILD is told from mainly three perspectives - Emma, Angela and Kate (the journalist) - though we did get Emma's dysfunctional mother Jude's perspective quite often also. Each woman has their own story to tell, and each story is gently woven into the others'. It begins with a baby's skeleton being discovered in a garden of one of many row houses being demolished. Each of the women find themselves in one way or another connected to the remains. For one, it brings a renewed hope with the possibility of closure; for another, it brings up a past and a long time secret she would rather keep buried; for yet another, it raises unanswered questions she would rather not face; and for Kate, it begins as just a human interest story that leads to an even bigger one in which she could maybe find answers to for one of these women. Taking place mainly in the present day, it does provide flashbacks through the women from the 1970s and 1980s revealing just how these remains could tie to them. Could these be the remains of a long time missing baby? Could they be an even bigger secret? These are questions Kate finds herself plagued with in an attempt to find out the truth and bring closure to one or all of these women. A slow-burning thriller, as opposed to edge of your seat, THE CHILD will keep you awake long into the night in a bid to discover the truth yourself. Just whose remains were they? A must for fans of this genre. The problem is that a secret takes on a life of its own over time. I used to believe if I didn’t think about what happened, it would shrivel and die. But it didn’t. It sits in the middle of a growing tangle of lies and fabrications, like a fat fly trapped in a spider’s web. If I say anything now it will mean ripping everything apart. So I must say nothing. I have to protect it. The secret, that is. It’s what I’ve done for as long as I can remember. Kept it safe. “Student Welfare? Goodness, he’ll be knee-deep in drugs and sexually transmitted diseases,’’ I say, relishing the idea of Derek, the most pompous man on earth, dealing with condom machines. “Because I want to know what happened, Joe. It’s called human interest. Not all news is about soap stars or politicians. This has got the makings of a good story. I can feel it in my waters.” Joe looked slightly squeamish. “It’s a saying, dear. Nothing gyno about it.” He looked mortified and she felt terrible. She was turning into one of the dinosaurs. Kate had been sent to try to get a talk with the family. They’d told her to piss off. She’d been glad. They looked like the cast of Deliverance. 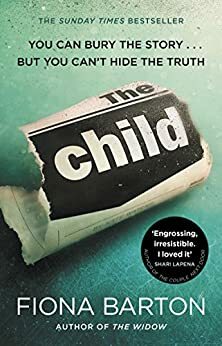 The Child was a tautly written, tightly coiled, complex, and intense read. I was transfixed by the intriguing, well-constructed, and maddingly paced storyline. I adored Kate, an overlooked reporter whose efforts solved a 42-year-old crime when she was unable to walk away from a quagmire of a mystery, one that started as a small snippet of detail from a two-line story she noticed in the newspaper. The storyline crackled with tension and Ms. Barton’s writing maintained a constant simmer as the plot slowly evolved with sharp and cleverly depicted details and emotional nuances. The plot bore an aura of heaviness emanating from the tragic find of newborn skeletal remains at a building site. I immediately began to devise and systematically discard multiple theories before finally settling on a heart-stopping possibility when the DNA evidence pointed first in one direction, then strangely, in another. The characters weren’t always admirable or likable, yet were consistently and oddly fascinating, clever, and uniquely compelling. I was riveted and engrossed as the intricate web of deceit and multiple layers of secrets were gradually untangled. Sigh, Ms. Barton delivered an ingenious plot and an expertly written and well-crafted book, but I believe I need to invest in a spa day before I scour my list for a comedy to read next.